PaperCamp2 happened this afternoon. Like the first one, it was excellent. Ben Terrett has done nice little review and you should check out the rest of his photos of the day too. 1.) Matt Jones [@moleitau] kicked off the day by saying he had “a new admiration for primary school teachers” and today has reminded me a lot of first school. Everything is creative. Making things is fun and there’s no such thing as a mistake. What a lovely way to spend a day. the work of Josef Albers, origamic architecture by Gerry Stormer, curved folds by David Huffman and clumsy but magical self folding origami. (When we wondered out loud how it works, Ben Terrett patiently and accurately explained “it’s got stuff on it”.) Matt’s clearly having a lot of fun at BERG, and I particularly enjoyed the glimpse behind the scenes of making Dimenions, especially the paper-based ‘post digital augmented reality’ of holding a small drawing on a piece of paper in front of your face to get a sense of the pyramids on the horizon or a Spitfire in flight (“It’s smaller than you’d think”). Update: Matt has written up details of his talk, so you can see what post digital augmented reality aka ‘Sticking A Bit Of Paper In Front Of Your Face’ looks like. 3.) At this point I noticed the tea urn in the Conway Hall sounds like applause. Comforting. It’s been there all day, quietly applauding us all. 5.) Camille Bozzini [@therealcamille] showed up some interesting and effective examples of paper advertising, including a rather nice ‘Ombro Cinema’ animation technique which is surprising and delighting, something that can’t always be said of adverts in newspapers. 6.) Laura Dickinson [@pbz1912]. I mean honestly, what must her brain be like? She maps mathematical models, constrained by the affordances and dimensions of paper, into 3d space and then back to nets which she cuts our and assembles into amazing shapes. There’s something delightfully pure and neat and accurate about it. 7.) Alexandra Deschamps-Sonsino [@iotwatch] told us why she loves postcards, and made us love them a bit more too. I got a shiver from the postcards from the future exhibition at the Museum of London. 8.) Have you heard of Riepl’s law? Wolfgang Riepl, writing about ancient and modern modes of news communications in 1913, hypothesizes that new media never replace the old. Instead, we end up using the older media differently. Television didn’t replace radio, it sits alongside it quite comfortably. The internet won’t kill off books, or television. Even if circulations of printed newspapers are dropping, newspapers are not going away. Look at what happened to painting when photography came along. Not dead, just different. At the end of his talk, Matt Brown summed it up nicely when he said “the pressure is off books for just imparting information”. Update: bonus thing 9.) just as we were tidying up and getting ready to go to the pub, Basil showed me this amazing paper procedural generator he built. Brilliant. Thanks for the summary of PaperCamp, I’m already sad I’ve missed it… somehow it went below radar in the mist of way to many happenings around. How do you know when the next one is taking place? Is there a mailing list/Twitter account for it? No website that I know of. Matt Jones is The Man though, so obviously keep an eye on him. 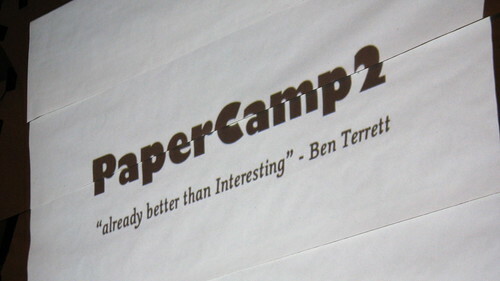 http://twitter.com/papercamp sprung up just beforehand, which will hopefully announce any future PaperCamp joy.